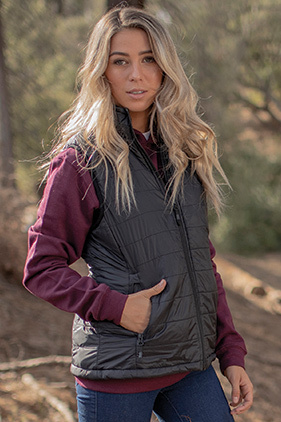 Puffy Vest has plush warmth for all seasons with a packable inside chest pocket, giving versatile function for any adventure. 100% nylon exterior shell, 100% polyester lining. Hyper-Loft synthetic insulation power women's puffy vest. Water & wind resistant. #5 reverse coil zippers at chest and pockets. Packable pocket with #3 reverse coil zipper. Capped elastic armhole binding. Locker loop at wearers back neck. Plastic cinche toggle at wearers right side waist. Chest pocket for concealed embroidery access. Tear away neck label.